On 23rd August 2015, we opened our store on Bath Street in Glasgow. Situated just a few metres from Buchanan street, opposite Topshop, it offers a very central location for people who need a repair in Glasgow. We offer high quality laptop repairs, carried out by Microsoft Certified technicians & Mac repairs carried out by Apple Certified technicians. So, if you have a slow Windows laptop, or a MacBook Pro with a broken screen, don't worry – SimplyFixIt in Glasgow can help. SimplyFixIt at Bath Street is rated an average of 4.6 (out of a maximum of 5) by 373 customers. Has your iPhone lost power, and won’t start back up again? Does your iPhone 6 have Touch Disease? Or maybe your iPhone 7 won’t play audio through the speakers? We can fix that. Replacing a broken screen is the most common repair that we do for iPhones, but SimplyFixIt at Bath Street is also able to do "board-level" repairs. Even Apple don't carry out repairs like this. For example, if your iPhone 7 has audio problems you will be expected to pay £316.44 for a replacement phone. But, SimplyFixIt can fix your iPhone. 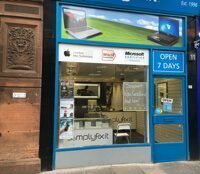 SimplyFixIt on Bath Street, Glasgow, offers a full range of laptop, Apple Mac and iPhone & iPad repairs. Just across the road from Topshop, on the corner of Buchanan Street and Bath Street, it really couldn’t be more central. SimplyFixIt on Bath Street also has the largest selection of certified refurbished Apple Macs in Glasgow. Everything from 13-inch MacBook Air devices, to the stunning Retina MacBook Pro – all at fantastic prices. We even stock a MacBook with a Flash Drive and the latest macOS for just £399. That’s an £850 saving on the Apple store’s cheapest MacBook. You can even trade in your existing Mac for further discount.